Amongst the many hats she wears, Iman Abdulmajid is popularly known as a fashion aficionado. She has also played perfectly as a model, actress, entrepreneur and social worker who has graced lots of cover magazines and walked on most runways as a model. After she caught the attention of a modeling agency while as a college student, she gave modeling a chance and has spent over a decade and counting in the career, making tremendous input as a model. She has been married thrice and is more famous for her union with David Bowie. Read on to find out more fascinating facts about Bowie’s wife. It was on the 25th day in the month of July 1955 that Iman was born in the capital of Somalia. She was named Zara Mohamed Abdulmajid but goes by the moniker, Iman. She spent a few years living with her grandparents in Somali before she was shipped off to a boarding school in Egypt when she was just four. So, it was in Egypt she spent most of her formative years and grew to be an adult. Subsequently, her family under the order of her father relocated to Kenya which later led to her enrollment in the University of Nairobi. There, she graduated with a degree in Political Science. Being from a nation who has a majority of its citizens practicing Islam, Iman Abdulmajid and her family are staunch Muslims. Also, she speaks Somali, Arabic, Italian, French, and English fluently. Iman while still, a college student caught the attention of an American photographer, Peter Beard. Her meeting with the photographer became the very means she used in garnering fame. She appeared in an edition of Vogue magazine in 1976 and subsequently became the cover of so many prestigious magazines. Also, Iman’s physique made her an amazing fit for each and every shoot. Soon, she began modeling for prominent organizations like Halston, Gianni, Versace, Calvi Klein, Issey Miyake, and Donna Karke. Photographers like Helmut Newton, Richard Avedon, Irving Penn, and Annie Leibovitz also worked with her during those years. After building her confidence as a model for close to two decades, the supermodel decided to create her own cosmetics firm launching her company, Iman in the year 1994. A company she started with the sole purpose of creating beauty products for all shades of women. From the very moment the company launched out, she has made an impact on the appearance of women who use her products. Subsequently, in 2007, Iman went ahead to create her own fashion line. Iman Abdulmajid has made progress in every step she has taken career-wise, she has also recorded appearances in movies. She made a guest appearance in the 1985 movie, Back in the World and later appeared in Love At First Sight (1998). She also graced The Cosby Show in 1985. Then in 1988, she played as Marie Babineaux in the 1988 movie, In The Heat Of The Night. Other movies credited to her name include The Human Factor, Out of Africa, No Way Out, Surrender, Lies Of the Twins amongst others. Her parents are Marian and Mohammed Abdulmajid. Her dad, Mohammed worked as the intermediary between Somali and Saudi Arabia as he represented his nation as an ambassador while her mom gained specialty in obstetrics and gynecology. Iman Abdulmajid is one of five children belonging to her parents. She has two brothers; Elias and Feisal and two younger sisters; Idil, and Nadia. Iman has been married thrice. Her marriage to Hassan took place when she was eighteen. She called off her union with him after she decided to move to the United States to pursue her modeling career. Upon getting to the States, she went ahead to date American actor, Warren Beatty and later got engaged to Spencer Haywood. With Spencer, she had a baby girl named Zulekha Haywood. After Iman Abdulmajid’s divorce with the father of her daughter, the model entered a relationship with David Bowie and subsequently married him in a very private wedding in Lausanne Switzerland. Their union is blessed with a daughter named Alexandria Zahra. 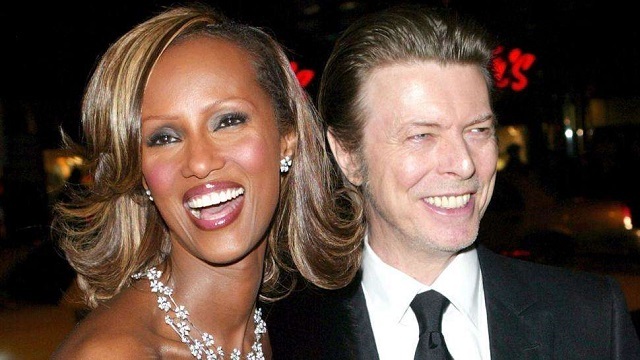 Automatically, Iman became the stepmother to David Bowie’s children from his previous relationship. Sadly David Bowie passed on the 10th of January 2016. Most of the prestigious fashion designers that have worked with Iman Abdulmajid often testify that her self confidence and outlook is one of her most catchy points as a model. She is regarded as one of the hottest models in the ’70s who exudes class. She stands at 5 feet 7 inches and weighs 58 Kg.